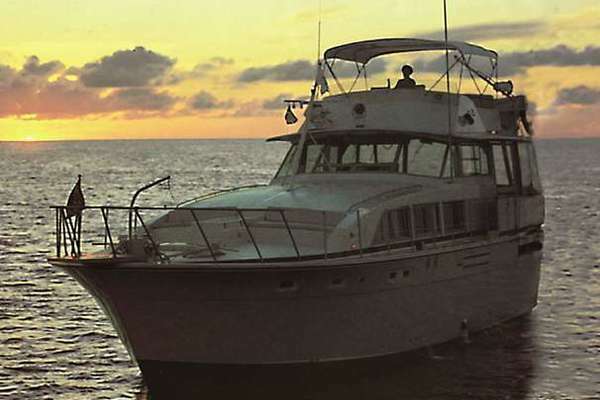 This is a very well kept example of Jefferson's Rivanna Series, a modern dual purpose trawler/motoryacht. Featuring the dependable twin 450 HP Cummins Diamond Series diesels, she is a very capable yacht with cruising speeds of up to 18 knots when desired . If you are interested in a more economical cruise, pull the throttles back to 8 knots and enjoy a miserly 4 gallon per hour with ample range for extended passages.This is a two stateroom galley down layout with a lower helm and beautiful High Gloss Teak Wood interior. She has a wonderful, fully enclosed, aft deck and the added benefit of a cockpit with a transom door. Her Fly-bridge is large and fully protected with all new Bimini and full four sided enclosure. (2018)This is a great looking, one owner boat, that was custom built to showcase this new design in the USA. She is hull number one of the 46 Rivanna series, and was the Miami Boat Show Boat in 2001. One of the very last of the Jefferson's built in the Her Shine yard in Taiwan prior to moving production to China.At over 52,000 lbs, this is no lightweight day boat. Combining her mass, (with a generous 15'9" beam, and a shallow 3'4" draft), gives one a proper cruising yacht with great Island and inland capabilities. United Yacht Sales New Jersey would love to guide you through a personal showing of this 46' Jefferson 46 Cockpit My 2001. 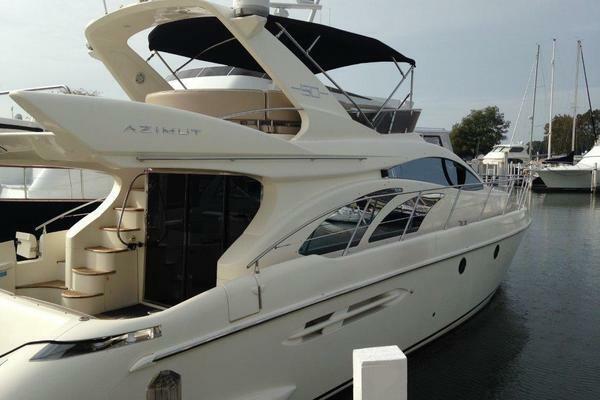 This yacht for sale is located in St. Petersburg, Florida and priced at $239,000. For a showing please contact us by filling out the form on this page and we will get back to you shortly! When boarding from the cockpit, you step aboard the swim platform, then through the transom door into the cockpit. To starboard one goes up a stairwell to the aft sun deck area. There is a load bearing hardtop overhead, a wet bar forward, port and starboard opening wing doors leading forward. and a stairwell to the fly-bridge. The aft deck is enclosed in Isinglass and there is casual furniture here. The fly-bridge is large and features a center line helm with L-shaped seating and table to starboard with additional bench seating to port. The helm has flush mounted electronics. The side decks are wide and protected by over-sized stainless welded safety rails. There are port and starboard boarding gates and a boarding ladder. Going down from the aft deck by a gentle stairwell one finds the salon with a lower helm forward to starboard and a custom L-shaped settee aft. Across to port is a the entertainment center and cabinetry. Down from the salon is the gourmet galley to port and a dinette to starboard. Forward is the guest stateroom with a large double berth to starboard and a very spacious head and separate shower stall aft. Engine room access is from the stairwell leading down from salon to galley. Headroom is 6’4” . The interior of the vessel is all done in high gloss Burmese teak with the quality fit and finish that will continue to endure. The cabin soles are satin finished solid teak planking, hanging lockers are cedar lined, and there is indirect lighting enhancing the beauty of the valances, berths and cabinetry. There are smoked glass door panels for display cabinets and electrical distribution panels. The amount of storage is truly impressive. No area was left idle, with cabinet doors everywhere one looks. The overall fit and finish of the interior is to very high standard and the condition is still close to new. There is no evidence of any water leaks and there is no visible damage or scratching to the finishes. The boat was ordered with an upgraded interior decor package and the effect is still to this day very becoming. The master Stateroom is aft and features a large queen sized center-line berth with a custom mattress. There are port and starboard cedar lined hanging lockers, lighted vanity, a concealed washer dryer and flat screen TV. There is rope lighting, valance lighting, halogen lighting in the overhead and reading lamps. Forward to starboard is the master head with a very large tub and shower combination and vanity with Corian style counter tops. The guest stateroom is all the way forward and features a very comfortable double berth offset to starboard with an overhead opening escape hatch and a settee and hanging locker to port. There are port and starboard opening port-lights and access to the chain locker forward. The guest head is aft to starboard and features a very comfortable separate stall shower and vanity sink. One notices the generous beam of the vessel in the salon. Features here include a custom built L shaped settee to starboard with easily accessible full storage beneath. There is a beautiful teak coffee table (with concealed door storage) and an upholstered barrel chair to port. The teak-planked floor is protected here by an area rug. There is a central vacuum system concealed aft. The entertainment center is to port and forward with a Flat Panel TV and concealed beneath in a cabinet is the stereo system with an AM/FM/CD player, coupled to a Satellite radio receiver and controls for all three zones of speakers. The aft deck of the vessel is a great entertaining area and is fully protected from the elements with a load bearing fiberglass hardtop, fiberglass wing doors with safety glass inserts, and a full 40 gauge Stratoglass enclosure (new in 2015). Forward is a wet bar with a concealed ice-maker, trash compactor and storage cabinet. There is a love seat, two swivel chairs, serving table and two end tables aft. There is a sliding pass-through window to the flybridge. The flybridge is accessed by a stairwell from the aft deck and protected by a hinged glass door. Here one finds a center-line helm seat with L shaped seating and table to starboard and a bench seat across to port. The electronics are all flush mounted into the modern helm console which has full storage beneath. There is also a hinged FRP radar arch, and access out to the load bearing hardtop that is a great sunning area or can be a boat deck. The cockpit is easily accessed by a stairwell from the aft deck and features a transom door leading out to the swim platform. There is a hot and cold shower, shore power connections, raw water washdown and a large storage area beneath the deck. The modern galley is forward and down two steps from the salon. It is open overhead to forward salon windows giving it an open and modern feeling. The cabin soles are teak, and the amount of cabinet storage is impressive. The galley comes fully equipped with a full set of utensils, cooking ware, glasses and and dishes. Everything you need to begin your voyage in style and comfort. The Solid Teak dinette will convert to a berth. Twin Cummins6CTA8.3M2 Marine Diesel engines with approximately 2300 hours. These are proven workhorses which have become the preferred engine in this horse power class. Engines were serviced in 2018 with all fluids changed and cooling systems flushed. Propellers also reconditioned. This Jefferson Rivanna is a very well kept yacht that has had the best of care. She is a one owner yacht and is a Great Loop Veteran. She comes fully equipped and furnished with all navigational, fenders and lines and accessories (including all needed galley equipment) required to make the Great Loop again. Benefiting from a generous 15'9" beam (plus a shallow 3'4" draft), a low air draft, with two very comfortable staterooms and a lower helm, Cummins C series diesels, and a beautiful high gloss teak interior there are many great features. For one seeking a Great Loop Capable, luxury cruising yacht that has been well owned, this Rivanna demands serious consideration. Owner retiring from boating.